Aaron just got back from a vacation–alone, in Hawaii, with no kids or wife. Just him and surfing all day long, everyday. It was a dream come true for him. He came back bearing gifts, although not exactly what I was hoping for. I was hoping for malasadas (Portuguese doughnuts) and poke but he couldn’t figure out the best way to transport those goodies. Instead he brought me a cute, malasada T-shirt and a bunch of poke making supplies. 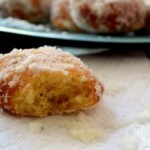 Even though I didn’t get my malasada fix from Aaron, I remembered that I know how to make these Portuguese delicacies! 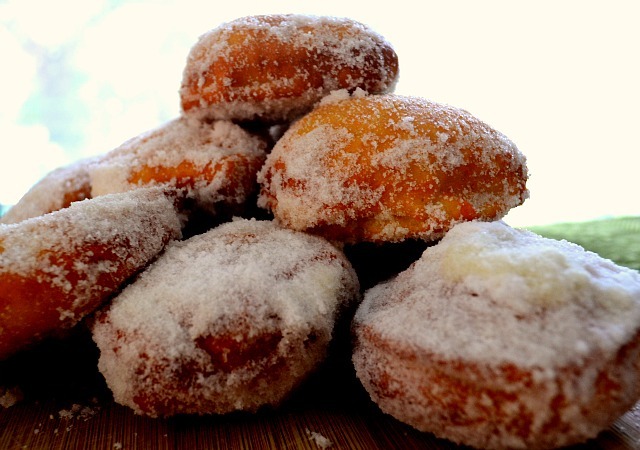 Malasadas are super popular pieces of fried dough that you find at every fair and fundraising activity. If you happen to be in Hawaii, one of the best places to get malasadas is Leonard’s bakery in Kaimuki. 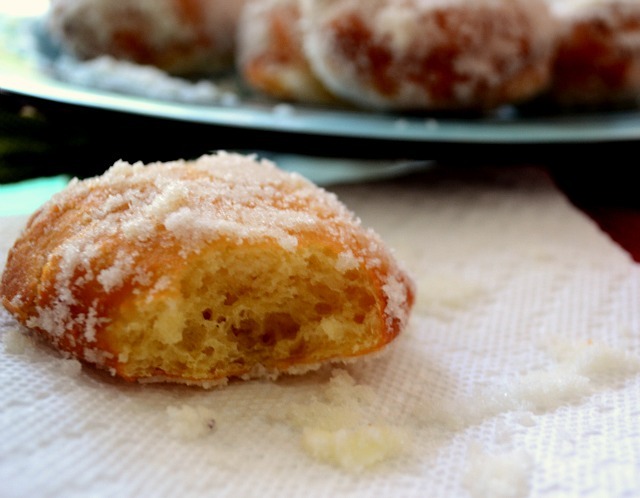 They come to you fresh from the fryer….still warm and coated in sugar. The dough is light and chewy and the outside is slightly crunchy. I’m not a fan of frying things but I was using a yeasted dough to test another recipe and had some time on my hands. I heated up some oil and threw in some pieces of dough. They were dark brown immediately. 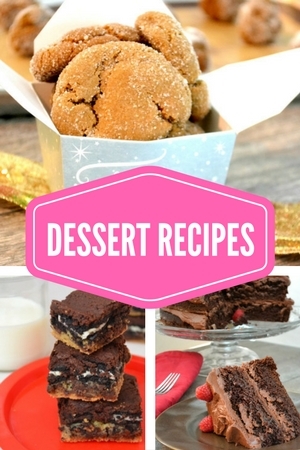 They puffed up…and looked appealing from the outside but inside they were just raw dough. All of those went into the garbage. For the next attempt, I cut the dough into small circle (about 2 inches in diameter) and let them rise overnight. They puffed up quite nicely. Then, I heated the oil—very slowly. I have always had a problem with patience and this was hard for me. I used a thermometer to keep the oil at a steady 350 degrees. It was amazing how different the experience was. Not only did the malasadas turn a nice toasty brown (about 1 minute on each side) they were cooked all the way through. Once they came out of the oil, they were tossed in a bowl of sugar. You really want to eat these when they are warm. And, if you don’t eat them someone else will. In a large bowl, add the yeast to 1/3 cup of the milk. Let stand until frothy--about 5 minutes. In a separate bowl, combine the butter and sugar and 1 cup of milk. Stir together well. Slowly add the eggs and flour. Let the dough hook do the work here and really mix up your dough. You will want the dough to pull away from the sides and become smooth and supple. You may need to add a bit more flour or milk to get it to the correct consistency. Place your dough ball in a lightly oiled bowl and cover in a warm area. I put mine on a shelf outside since it has been so warm lately. Or, you can just set on the stove-top with the oven on. Let rise for 1 hour or until doubled in size. After an hour, punch down your dough and roll it out into a rectangle. Cut the dough into small circles. You don't have to picky about the shape of them but you want them to be about 2 inches in diameter. Lay the circle on parchment paper on a cookie sheet or other flat surface. Cover and let rise in a warm area for 2-10 hours. When you are ready to fry them, heat up 2-3 inches of oil in a pan. Use a thermometer to keep the oil right at 350 degrees. Drop one or two dough balls into the oil at a time, turning at about 1 minute. They should turn nice and brown on each side. You may want to test one to see if they are done in the middle but with the oil at 350 degrees and cooking for 1-1 1/2 minutes per side---you should be OK. Immediately after the hot oil bath, toss them in a large bowl of granulated sugar. Toss until covered completely.